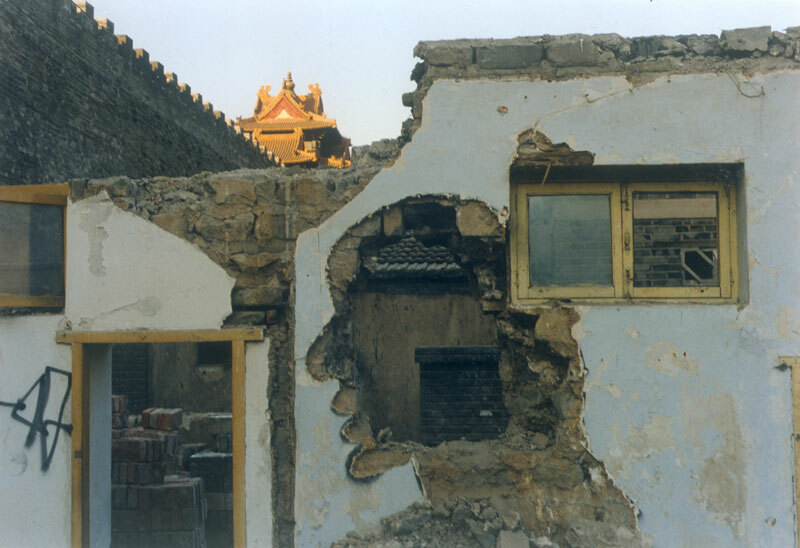 In Demolition: Forbidden City, Beijing¡ (1998), Zhang Dali captures the course of Beijing’s massive urban transformation. 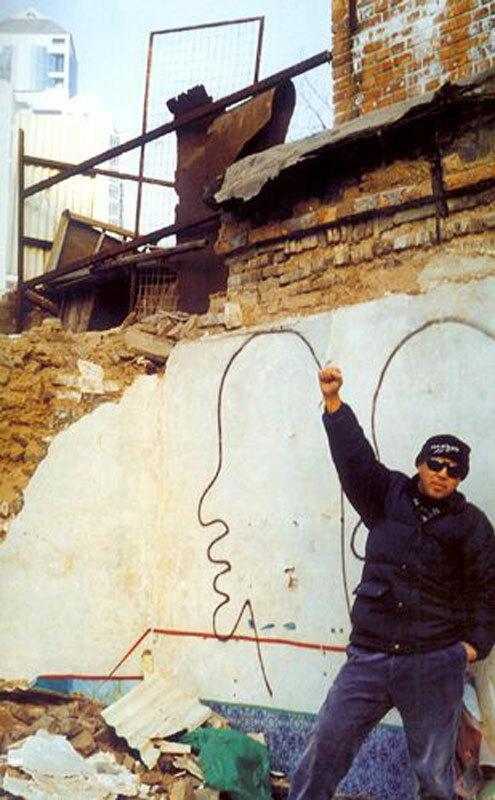 A photographer and graffiti artist,Zhang spray paints an outline of his own head onto buildings scheduled for demolition. He knocks out the large head-shaped hole, through which can be glimpsed the roofs of the Forbidden City, dramatically contrasting the vanishing and emerging architecture of China’s capital city.Because there were no available spaces–no galleries, no museums in which I could exhibit my work, I thought, « Let’s forget about a formal space; let’s do something which is directly related to and takes place in the environment. » I consequently started painting my logo, a stylized self-portrait based on the shape of my own skull. This logo by itself is not the work; it only becomes a work after it is placed in a specific context, and it changes its meaning as the context changes­.. I put my works on the walls of the street so that more people can see them, so at least they will now what I am doing. Even if the Zhongguo Meishu Guan (China Art Gallery), the officially approved space for the exhibition of contemporary art at a national level and the site of the most official and influential contemporary art exhibitions, could provide me with a space to exhibit, that space would inherently bring in a set of limitations. The public that goes to the China Art Gallery consists of either people from the academies of fine arts or people who are otherwise connected to the art world. Other people in China very seldom go to the China Art Gallery to see art. Ask your neighbors. They probably haven’t entered a museum for years, if ever. And earlier there wasn’t even a China Art Gallery. Now that there is one, it serves as a site of government propaganda. It is certainly not a space for artists to exhibit their works. In the recent past there was no art market either, no commercial art. So the artist would exist in a space that did not belong anywhere: on the one hand, you don’t belong to the masses, since people don’t understand what you are doing because you have no space in which to exhibit–no space in which to explain to them what your work is about. On the other, the government doesn’t support you. So where does one exhibit? You can put your work in the streets; this is the only and the best way. During the last ten years of modernization, Chinese society has become more tolerant. You can do your work in the street, and the authorities don’t care too much. The pace of life is also much quicker. Passers-by may or may not have a glimpse; it doesn’t matter, for at least you have a place to show. I like the fact that the number of people seeing my work keeps growing, and so, I think, does the number of people looking at art. 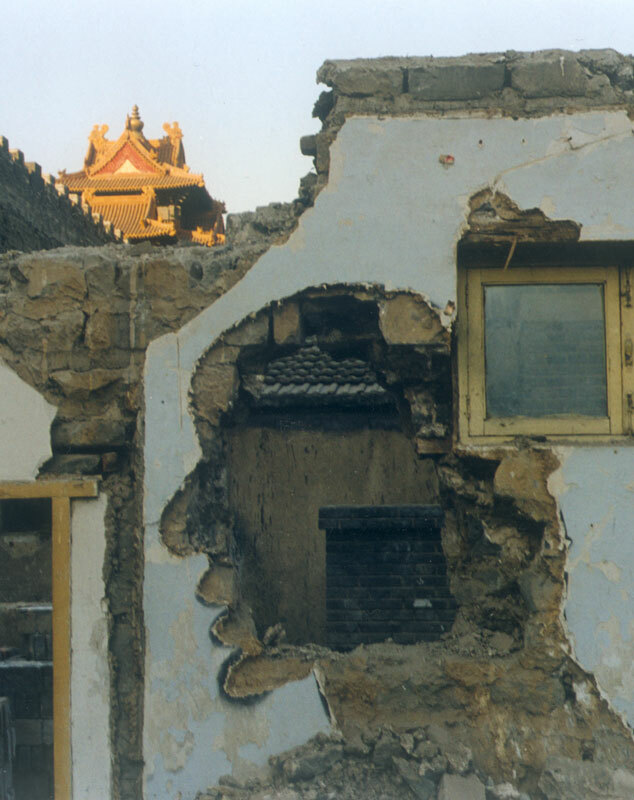 In 1999 I began another type of work-a project related to the demolition of the old parts of the city of Beijing. Demolition sites were ubiquitous. I started demolishing buildings already destined for destruction, carving out holes in the walls in the shape of my logo, the bald head that I used in my previous work, Dialogue. In this case, more people would see the work, and I could use the context of the demolition of old Beijing as part of it. The space we’re living in is changing. The fengshui and aura of the past city is changed by model streets. The combination of money and politics created skyscrapers as well as crumbly buildings. This is also changing the people’s spirit. My art is a product of such an environment, where the status of change is at the core of my concerns. Like all others, I hesitate between red slogans and stinky money. The signs of human beings are in a dialogue with every kind of people living in the city. They are also involved in a dialogue with the swiftly changing environment. When there would be a day when you could not find your way home because of the changed environment, my signs would work just as Trafic signs that would tell you how to get back home.